The iPad Pro is the biggest thing to happen to Apple's iPad line-up. Yes, that’s a pun, and I apologize for using it, but it’s also true. 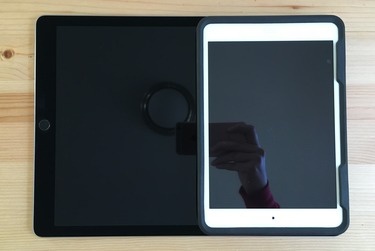 Although Apple has gone smaller and thinner with iPads before -- the 7.9-in. mini, for instance -- until this past week, it had never gone bigger. The result of that move is the 12.9-in. iPad Pro, which starts at $799 for a 32GB model and goes all the way to $1,079 for a 128GB version with both Wi-Fi and LTE cellular connectivity -- accessories not included. In fact, getting your hands on those accessories, the new Smart Keyboard and Apple Pencil for the iPad Pro, is harder than getting the tablet itself. And getting the exact iPad Pro you need isn't easy either. From what I've seen online and in actual stores since the iPad Pro arrived on Wednesday, the top-end models are selling out nearly as fast as stores get them in. I should know. Over the course of three days I briefly "owned" three iPad Pros: The 32GB model I got on Wednesday (when the 128GB versions in Space Gray sold out at the local Apple Store); a 128GB version I picked up on Friday when the local Best Buy got a few in stock; and finally, the unicorn model I had wanted all along: the $1,079 iPad Pro with LTE and GPS I snagged at the Cambridgeside Apple Store Friday night. It's easy to see why they're selling so quickly: The new iPad Pro features a wicked fast third-generation, 64-bit Apple A9X chip, 4GB of memory, 10-hour estimated battery life, and that absolutely gorgeous 12.9-in. 2732-x-2048-pixel Retina display that is packed with more pixels than the 15-in. MacBook Pro. With its large screen and with the optional keyboard case and Apple Pencil, I can easily see the iPad Pro attracting a lot of attention from everyday computer users and businesses alike. 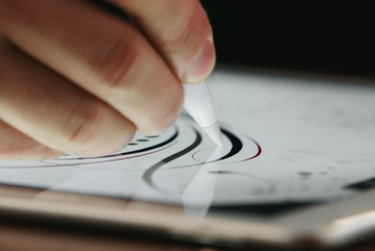 The Apple Pencil makes the new iPad Pro more versatile than any of its predecessors. In the box, the iPad Pro comes with the bare essentials: the tablet itself, a longer than normal Lightning-to-USB cable, and a USB power adapter. When taking the iPad Pro out of the box, my first impressions were like virtually everyone else who's gotten one: Wow -- that's a big iPad. Thankfully, it doesn't weigh as much as you'd think; at just over a pound-and-a-half, it weighs as much as the first-generation iPad from 2010. But that first iPad only had a 9.7-in., 1024-x-768-pixel display, much slower internal hardware, no camera, and it was a half-inch thick. By comparison, the latest device measures 12 inches x 8.68 inches and it's 0.27 inches thick. For its size, the iPad Pro feels light, but at 1.57 pounds (1.59 pounds for the Wi-Fi/LTE model), you're definitely looking at wrist fatigue with extended use if you're carrying it around in one hand. So far, that's not how I've found myself using it; without realizing it, I've been using the iPad Pro on my lap, like a little touchscreen table. This tablet -- with a processor that's as fast as some late-model laptops -- is turning out to be the perfect laptop computer in a very literal sense. Despite its larger size, the iPad Pro home screen shows the same app layout grid as its smaller siblings. The iPad Pro feels really fast. It zips through the interface, loading apps and data quickly. 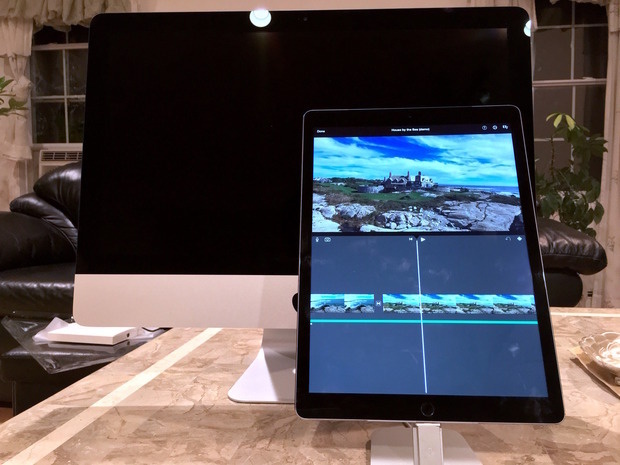 Powered by that custom-designed Apple A9X chipset, the iPad Pro out-performs the 12-in. MacBook in CPU benchmark scores, and is faster than the current MacBook Pro with Intel's Iris 5200 integrated graphics in GPU benchmarks. Also impressive: The sound the iPad Pro puts out. Apple etched the speaker housings as part of the unibody enclosure, and placed speakers on all four corners. The iPad is programmed to be aware of its orientation, and at any angle the topmost speakers are dedicated to producing higher frequencies, with the speakers on the lower side pushing more bass. The result is an iPad that truly sounds amazing. At one point during my quick round of early testing, I reached for the Apple TV remote to lower the volume of my living room entertainment system. Except the entertainment system wasn't on; the iPad Pro was producing the loud audio. I'm not saying it's a substitute for a surround sound system, but the sound quality is so good that for a split second, I was fooled into thinking the music couldn't be coming from the iPad. Audiophiles will be pleased, both at the level of volume those four small speakers emit and the clarity and tone they produce. Your eyes will naturally be drawn to the big screen, but your ears will love the sound. The iPad Pro is a natural for these new features, but it doesn't have either one. I miss them. Apple hasn't said why 3D Touch isn't part if the iPad Pro package, or whether it's a hardware issue related to the technology or an intentional omission. (I'd assume it's the latter. While the first-generation iPad Pro doesn't have 3D Touch, I bet future generations will.) The lack of Reachability on the iPad Pro is also puzzling, though it makes more sense, given that one-handed use of the big tablet isn't as easy as it is with the phone. Something else I've noticed -- and this isn't Apple's fault -- is that some popular iOS 9 apps haven't been updated to take advantage of the larger screen. Case in point: The current Facebook app shows a lot of wasted space. 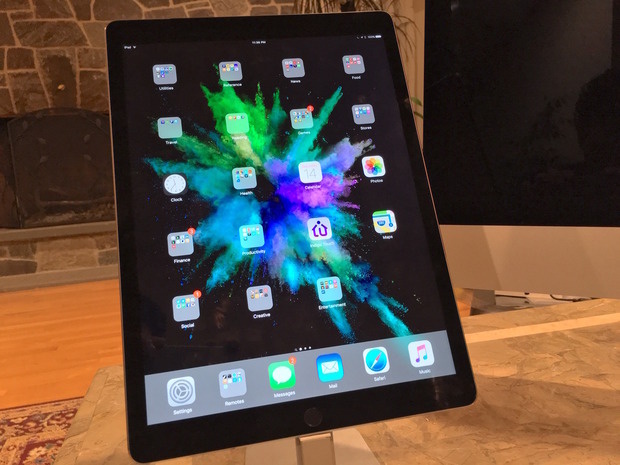 It looks great on the iPad Air 2, but on the iPad Pro, it's simply been scaled up in size. For now, I'm accessing Facebook through the Safari browser because Safari utilizes space better. 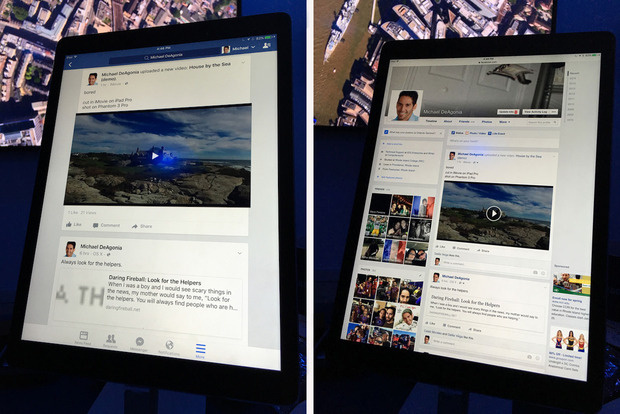 On the iPad Pro, the Facebook app (left) shows much less content than you can see by viewing Facebook through Safari (right). No doubt, that will change as third-party developers update their apps. And Apple is already highlighting iPad Pro-worthy apps in the App Store. As nice as the hardware is, as great as the display is, in the end the iPad Pro experience depends on the quality of the software available for it. That's true whether you see it as more of a content-consuming tablet or a business-centric productivity device. In my time with the iPad Pro, I've found it fantastic for consuming media, especially comic books and high-definition videos. Games look great, too. But as noted, apps that haven't been rewritten for the iPad Pro's display size and resolution end up wasting a ton of screen real estate. The recently-introduced multitasking capabilities of iOS 9 -- the split-screen option allowing you to use two apps at one time -- really make use of the additional space, but I'm already wondering if that's enough. On the hardware side of the equation, a lot is riding on the new Smart Keyboard and Apple Pencil, and how well these two add-ons work in extending the tablet's use potential. I'll be testing those as soon as I can get my hands on them, and will have a better sense of whether Apple has delivered something beyond just a bigger, better, faster tablet. This much seems clear already: With all of the technology built in, and the accessories to come, all of the pieces are in place to make the iPad Pro a hit for consumers and businesses alike. Check back on Computerworld.com in a couple of weeks for my more formal, detailed review. The iPad Pro stacks up nicely against the 21.5-in. iMac.